NASA's planet-hunting TESS mission has only been surveying the sky since July, but it's already making incredible discoveries, CNN reported. In January, three exoplanet discoveries were connected to the initial observations from TESS. Now, data collected by TESS has determined a new Saturn-size planet. TOI (TESS Object of Interest) 197.01 is considered to be a "hot Saturn." It's similar in size to that planet and orbits its host star at a close distance, circling it every 14 days, which creates a high surface temperature on the planet. The planet is described in a paper that will be published in The Astronomical Journal. Asteroseismologists discovered the planet by studying seismic waves called starquakes in stars where the brightness appears to shift. The astronomers can determine the age of the star, as well as its mass and radius. Combining that data with other observations reveals the properties of the exoplanets that orbit these host stars. The exoplanet is a gas giant with a radius nine times that of Earth and about 60 times the mass of Earth. The host star is 5 billion years old and slightly heavier and larger than our sun. "This is the first bucketful of water from the fire hose of data we're getting from TESS," said Steve Kawaler, study co-author and Iowa State University professor of physics and astronomy, in a statement. "The thing that's exciting is that TESS is the only game in town for a while and the data are so good that we're planning to try to do science we hadn't thought about. Maybe we can also look at the very faint stars -- the white dwarfs -- that are my first love and represent the future of our Sun and solar system." The Transiting Exoplanet Survey Satellite launched in April to take up the planet-hunting baton from the Kepler space telescope as that historic mission ended. TESS is surveying an area in the sky that is 400 times larger than what Kepler observed, including 200,000 of the brightest nearby stars. Over the course of two years, the four wide-field cameras on board will stare at different sectors of the sky for days at a time. This will enable scientists to survey nearly the entire sky. This week, a team of astronomers identified a list of what might be the most promising stars to support planets in the habitable zone called the TESS Habitable Zone Star Catalog, which was published in the Astrophysical Journal Letters. The catalog includes 1,822 stars that TESS could observe where planets slightly larger than Earth would exist in the habitable zone of their star. The habitable zone, called the Goldilocks zone, is when conditions are warm enough to allow liquid water to exist on the planet's surface. And liquid water is the foundation of life as we know it. 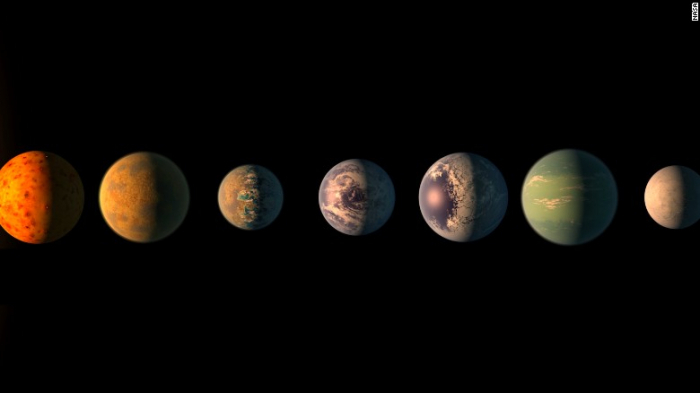 "Life could exist on all sorts of worlds, but the kind we know can support life is our own, so it makes sense to first look for Earth-like planets," said Lisa Kaltenegger, lead author and member of the TESS Science team at Cornell University, in a statement. "This catalog is important for TESS because anyone working with the data wants to know around which stars we can find the closest Earth-analogs." And 408 stars might support planets the size of Earth that receive a similar amount of radiation that we receive from the sun. "I have 408 new favorite stars," Kaltenegger said. "It is amazing that I don't have to pick just one; I now get to search hundreds of stars." There's also a subset of 227 stars in the catalog where TESS can conduct a wider search for cooler Mars-like planets to provide a bigger range of worlds in the universe. "We don't know how many planets TESS will find around the hundreds of stars in our catalog or whether they will be habitable," Kaltenegger said. "But the odds are in our favor. Some studies indicate that there are many rocky planets in the habitable zone of cool stars, like the ones in our catalog. We're excited to see what worlds we'll find." These exoplanets will be studied so that NASA can determine the best targets for missions like the James Webb Space Telescope. That telescope, launching in 2021, would be able to characterize the details and atmospheres of exoplanets in ways scientists have not been able to do.